Nobody trips over mountains. It’s the small pebbles that cause you to stumble. What most people don’t realize is that the gift industry has a culture all its own. Sure, the basics of operating a business are the same for any kind of business. You need a business plan. You can read a financial statement. And you took a business class that told you all you thought you needed to know. But the gift industry has its own mindset, its own psychology — even language, so to speak. It’s simple. If your business hasn’t grown as fast as you would like; if you aren’t making as much money as you hoped; if you feel overwhelmed by just running your business day-by-day, you don’t have to feel that you are all alone. 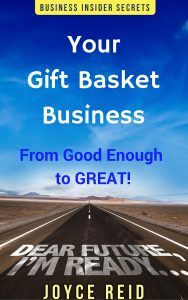 There is help available when you click your mouse on the BUY button and read this guide written by one of the leading experts, with other twenty five years experience in the gift basket business and over 40 years experience as a small business entrepreneur. This ebook guides you through the process of reviewing where your business has come, where it is now, and where you want to go. When you are finished, you will have a plan to take your business from just “good enough” to GREAT.